For decades, Cristóbal de Villalpando’s Adoration of the Magi had been hiding in plain sight at Fordham. This year, it was part of a major show at the Metropolitan Museum of Art. 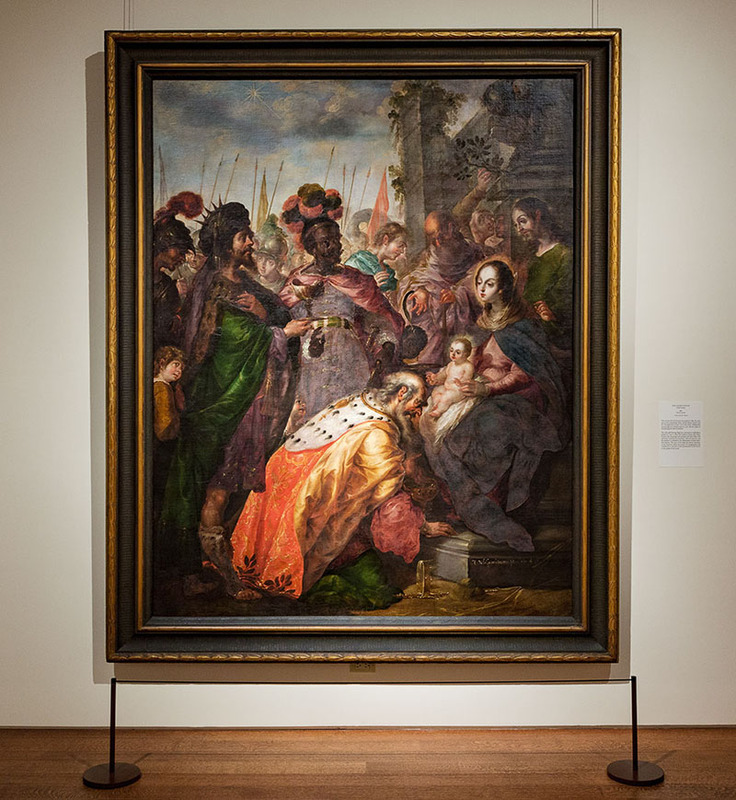 When visitors to the Metropolitan Museum of Art took in the exhibition Cristóbal de Villalpando: Mexican Painter of the Baroque from late July to mid-October this year, one of the paintings they likely saw for the first time was The Adoration of the Magi. For more than a century, it had been seen only by visitors to the Fordham president’s office in Cunniffe House. The 1683 painting depicts the famous scene from the Gospel of Matthew when kings, or magi, visited the infant Jesus. It was given to Fordham during the mid-19th century, shortly after the University’s founding, and likely first put on display at Fordham sometime around 1900. Villalpando, who lived from 1649 to 1714, emerged in the 1680s as a leading painter in viceregal Mexico and one of the most innovative and accomplished artists in the Spanish art world. During his lifetime, he exported paintings widely throughout Latin America. The Adoration of the Magi, which was based on an early 17th-century engraving of the same title by Peter Paul Rubens, was touted as one of the highlights of the Met show, along with Moses and the Brazen Serpent and the Transfiguration of Jesus, a 28-foot-tall masterpiece Villalpando also painted in 1683. 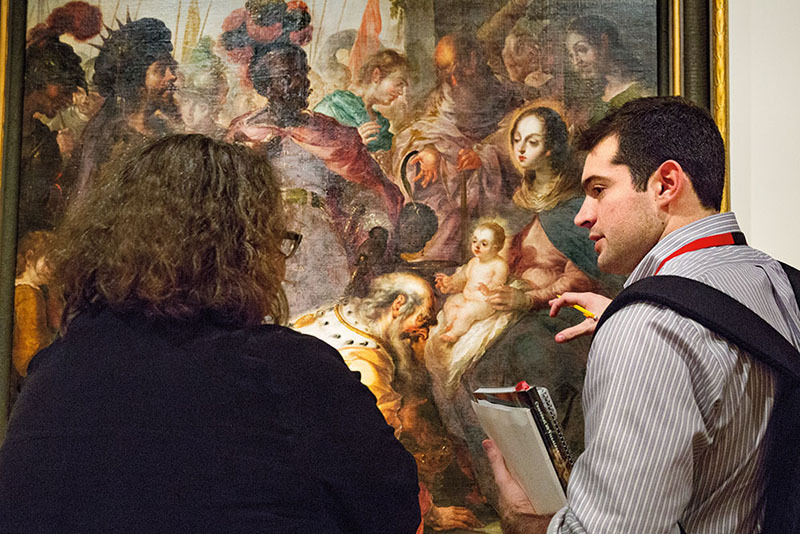 Ronda Kasl, curator of Latin American art in the American Wing at the Met, said The Adoration of the Magi is significant because it reveals Villalpando’s capacity to envision the divine. “The subject itself is fundamentally concerned with the revelation of divinity. The holy child’s humanity is manifest in his nakedness, while his divinity and his mother’s is revealed in the illumination of their idealized features,” she said. 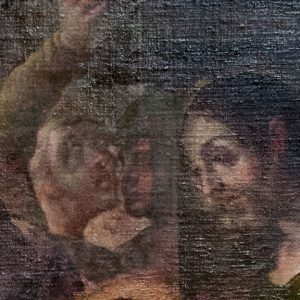 The painting had hung at the Rose Hill campus long before Barbara Mundy, Ph.D., professor of art history and Latin American and Latino studies at Fordham, stumbled upon a mention of it in the University archives while researching several other paintings in the Fordham collection. “It must have been in 1999 or so,” she said, “when the president’s office asked me to look at four paintings in the council room that somebody thought might be from Latin America. It turns out they were not particularly good or notable paintings, but in doing a little research on them I found mention of a painting by Cristóbal de Villalpando. That intrigued me because he’s an immensely important Mexican painter. He’s like a Michelangelo of Mexico in the 17th century,” she said. 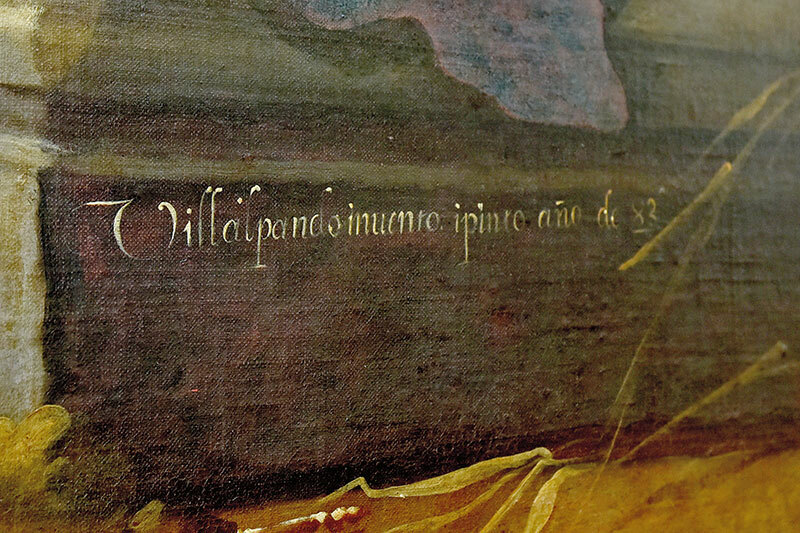 The document she found, an inventory of art at Fordham that was taken during the 1940s, described the Fordham Villalpando as being more than eight feet tall. But when she tried to determine its whereabouts, nobody seemed to have any information—until she mentioned the subject matter. Getting The Adoration of the Magi from Rose Hill to the Met was no simple task, however. “The painting was literally nailed into the wall, at least since the 1940s,” Mundy said. So in September 2016, the Met sent a team of specialists to Fordham, and they worked closely with Fordham’s carpenters to make sure the painting could be removed safely, without damaging either the 334-year-old artwork or the wall itself. 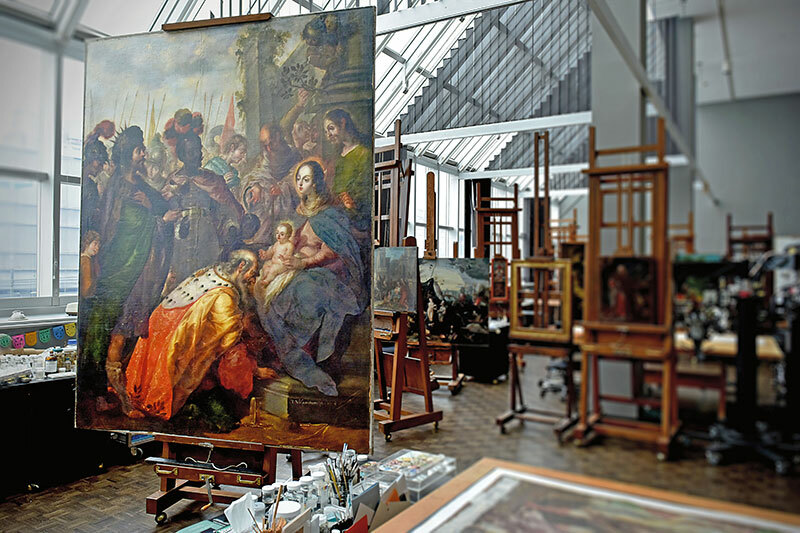 Because of its size—78 inches wide and 99 inches high—the painting was Met conservator Dorothy Mahon’s primary focus for nearly 10 months, during which time she traveled to Mexico to see other examples of Villalpando’s work during the same period in his life. Mahon said that the varnish coating the painting had to be delicately removed and replaced, and although the structure of the painting was in good condition when she received it, the backing holding the canvas taut needed to be replaced. 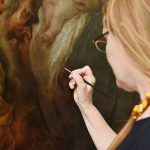 “It’s a big picture, so it had lots of varnish and lots of discoloration,” she said, noting that every step of the restoration was painstakingly done by hand with custom-made tools and adhesives. At a July 24 preview of the Met show for members of the media, Diego Gómez Pickering, consul general of Mexico in New York, said the exhibit could not come at a better time for the estimated 1 million Mexican Americans living in the New York metropolitan area, many of whom, like Villalpando, hail from the state of Puebla. Mundy said she’s pleased that the exhibition has called greater public attention to the “extraordinary quality and beauty and richness of Mexican painting.” She said she sees the show as part of a trend in which big U.S. museums are looking beyond traditional subject matter. One of those students, Peter Vergara, called the exhibition a “cornerstone show for the Latin American art scene as a whole,” and he said seeing it and the Villalpando exhibit at the Met have been formative experiences for him. 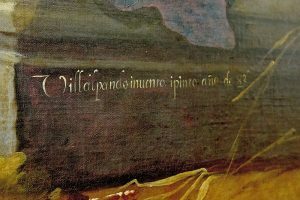 Vergara, a Fordham senior who is writing his final seminar research paper on the Fordham Villalpando painting, knows firsthand the value of cross-cultural experiences. He was born in Washington, D.C., but moved with his family to Spain as a toddler when his father took a job in Madrid. He grew up speaking English and Spanish, and spent countless hours at the Prado Museum. Vergara moved to the U.S. to attend Portsmouth Abbey School, a Catholic boarding school in Rhode Island, and enrolled at Fordham in 2014. As a first-year student, he developed a passion for art history through two courses in particular, including one on colonization in Latin America, and with support from Mundy and other Fordham professors, landed a string of internships—at the Hispanic Society, the Cloisters, and Sotheby’s. “I was aware of this world of Latin American art from freshman year, and now it’s shaping where I want to go with my career,” said Vergara, who has applied for a Fulbright study grant to Mexico, where he has been accepted into a master’s degree program at Universidad Iberoamericana. Mundy called the inclusion of The Adoration of the Magi in the Met exhibit a long-overdue recognition for a masterpiece that for many years was hidden in plain sight. She’s especially taken by Villalpando’s ability to “paint the emotion in scenes,” she said. “You can see the response of all of the figures to the Christ child. You can see the awe and the adulation that the magi are feeling, and you can see the wonderful, calm serenity in Mary’s face. —Ryan Stellabotte contributed to this story.